I’m a little stressed out. Between working full-time, Nutrition School, my blog, and trying to plan a move to Dallas I just can’t seem to find enough hours in the day. With a million things going on AND a freezing cold office, I knew something warm and comforting was on the menu for dinner tonight. And when my boss decided we were having a 5:30pm meeting, “quick” got added to that list. 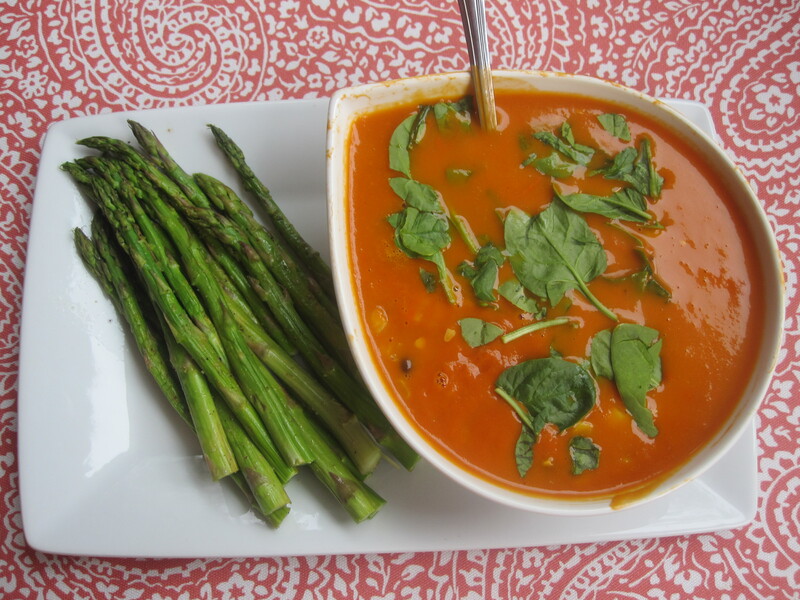 Enter: Doctored up Trader Joe’s Roasted Red Pepper Soup and a side of roasted asparagus. 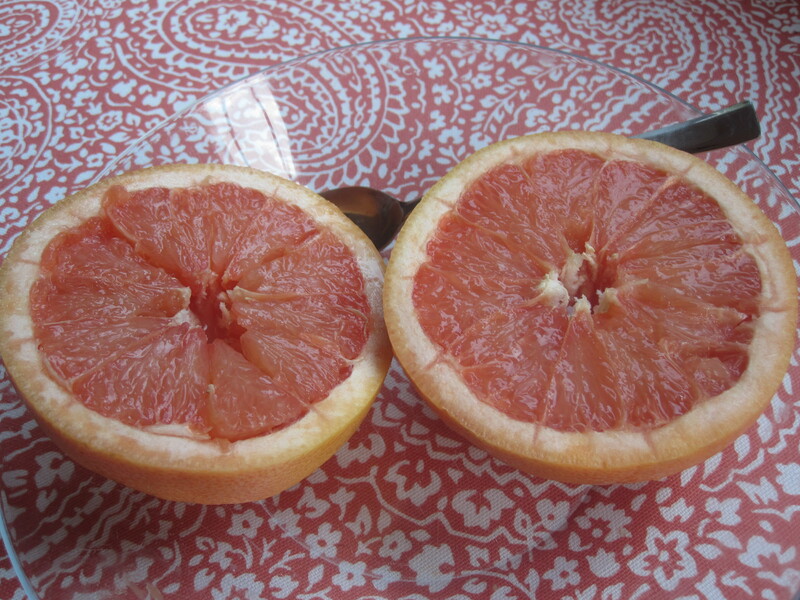 A grapefruit was a sweet ending to the meal, but now I’m aggressively chomping on tortilla chips and dark chocolate chips. I can’t wait for my massage this weekend!! I love your spoon! It looks like a seashell! 🙂 My favorite soup is a recipe out of Ellie Krieger’s So Easy. It has whole wheat tortellini, spinach, fire roasted tomatoes, basil, carrots, celery, and I can’t remember what else though! It is definitely comforting! Hope you have a great week Clare! Roasted butternut and tomato soup and the bonus – its super easy to make at home! I love that the soup looks plain from a first look, but is actually full of goodies inside! Delicious! Love adding fresh ingredients to pre-made soups. Such a delicious shortcut! How adorbs is that spoon?! My favorite soup is Amy’s Veggie Barley… so tasty. that soup looks great! 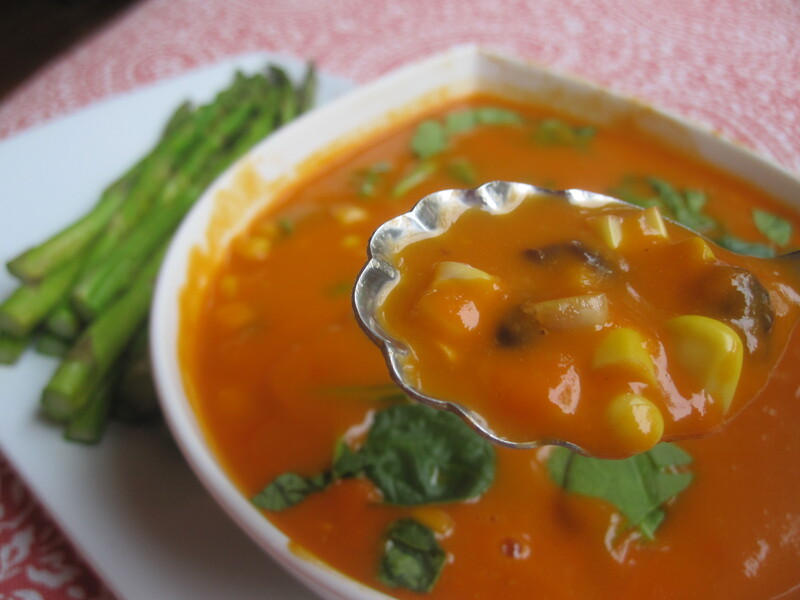 I love the idea of “doctoring up” a soup with veggies and beans…so smart! I like Amy’s Minestrone and Amy’s lentil & veggie! Great modification to the soup! and i hear ya on the busy…man oh man, story of my life.